What does your workspace look like? Do you have an ideal space? 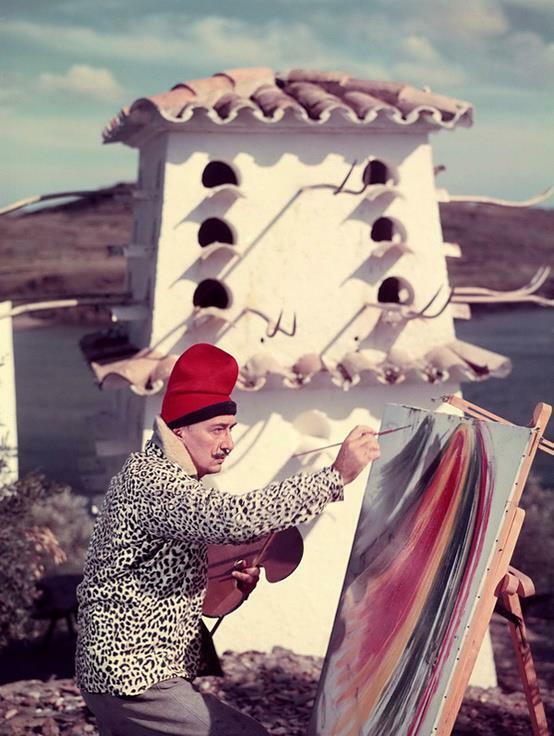 Do you enjoy seeing the spaces in which famous artists have worked? On a visit to NYC, I once saw an exhibit at the New York Public Library featuring items from famous workspaces. 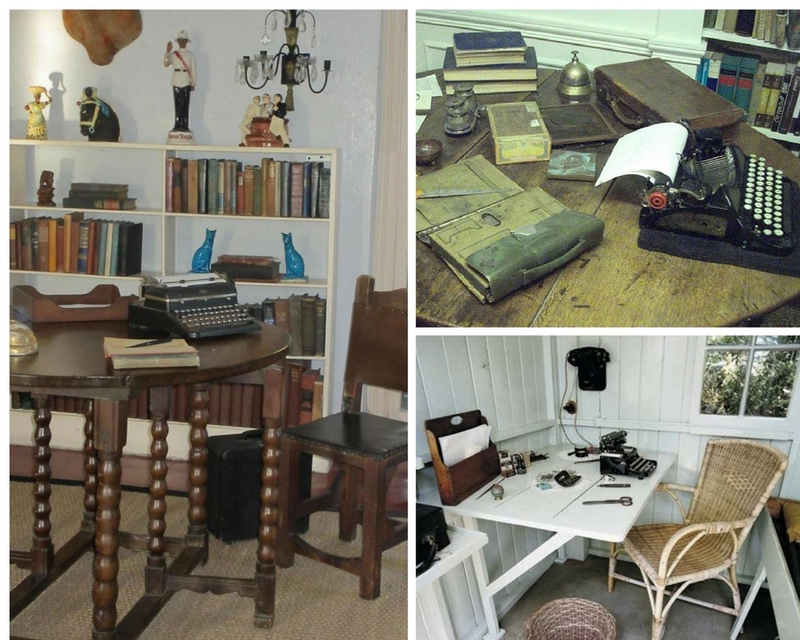 It featured a Hemingway typewriter, Kerouac’s desk (including everything he kept on it), a Gutenberg Bible, and many other artist’s artifacts. It was the greatest exhibit of any kind I have seen. My wife and I just finished making room in our shared office to set up my new workspace, which has me thinking about these things. Those of you who think of your space as much more than just a place to work, who think of it in terms bordering on magic or the divine, understand my fascination. Of course, some artists work best without the confines of a traditional workspace. Wallace Stevens composed his poetry on his daily walk to the insurance company for which he worked. “I write best when I can concentrate, and do that best while walking,” he said. D.H. Lawrence agreed. He preferred the company of trees, writing outdoors under whatever shade the locale provided. Agatha Christie would plot her mysteries while eating apples in a large Victorian bathtub. 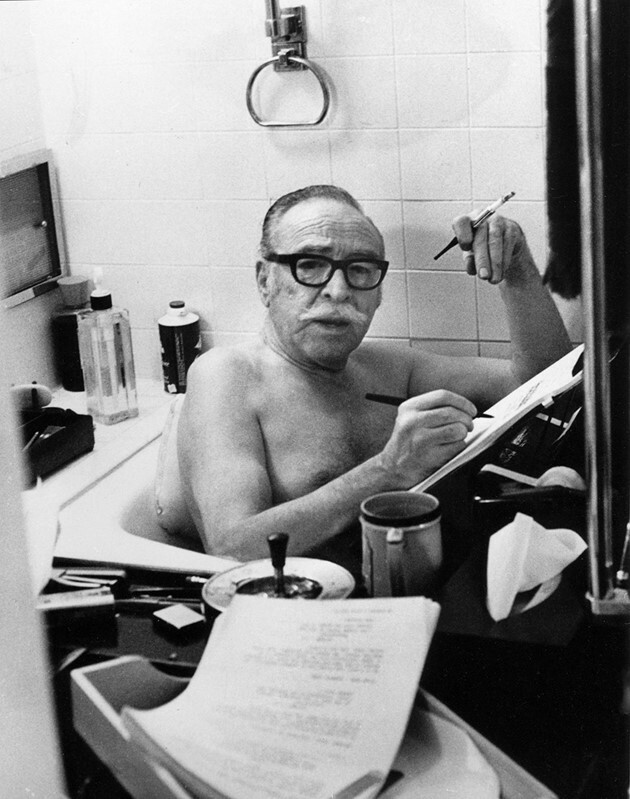 Dalton Trumbo also wrote in the tub, at night, with a parrot for company; however, judging from his picture, it seems there was quite a lot of desk space incorporated into his nocturnal writing sessions. Even more interesting is Ben Franklin’s working “baths.” He would shed his clothes and work naked in the open air of his bedroom in what he called a “tonic bath.” Apparently, Picasso also like to work semi-clothed. Left: Picasso in his studio. Some writers can work in busy spaces away from home. I have found that I can get a lot done at a bookstore, café, or coffee shop when there are people around, although at home I need a quiet space. For me, there is something about being in a place where the noise, the busyness of life, is impersonal, disconnected even, that allows me to find that internal, observant state of mind that makes for good writing. Also, the coffee helps. As an M15 officer, John le Carre would spend his 90 minute train commute penning his debut novel. About this experience, he once quipped, “The line has since been electrified, which is a great loss to literature.” Maya Angelou liked to work outside of home, but she wanted a controlled place with no distractions. She would write in a hotel room with everything removed from the walls. She would bring her own supplies, including yellow pads, a Bible, sherry and an ashtray (There is an entire essay out there about smoking and writing/creativity, but that is for someone else to write, and an activity quickly resigning itself to the past…Billy Collins has a nice poem about it titled The Best Cigarette). Some artists’ workspace seems to be overflowing with ideas, works in progress, books, supplies, and papers. I find I can’t get much done in a place like that. I really need some flat, open space; I need to see the wood of the table or desk where I am working. 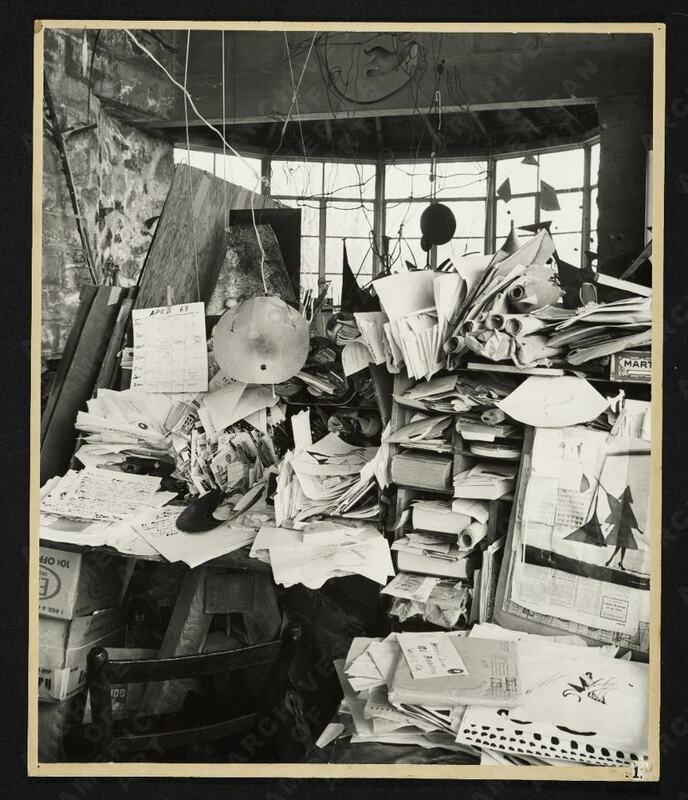 The immensity of the piles comprising Alexander Calder’s workspace is impressive. I wouldn’t be surprised if Alexander isn’t still in his workspace somewhere, buried under one of those piles. Now consider Tina Fey’s crowded space. In sharp contrast, look at the vast spaces where these creatives work. Virginia Woolf’s space looks gorgeous. Just imagine sitting there writing with both French doors open, a warm breeze and the smell of that fresh-cut lawn wafting in. Then again, who wouldn’t feel like getting up and going out to enjoy that warmth on your skin and the feel of green grass between your toes. Georgia O’Keefe’s studio looks almost like a painting itself. I would have rather seen it as it looked while she was painting; it is too staged in that photo. Rothko’s space, understandably, would need to be open (as, I suspect, would Jackson Pollock’s). What is so great about Rothko’s photo is the Adirondack chair he is sitting in and the satisfaction his body position is portraying as he contemplates his work with a smoke. 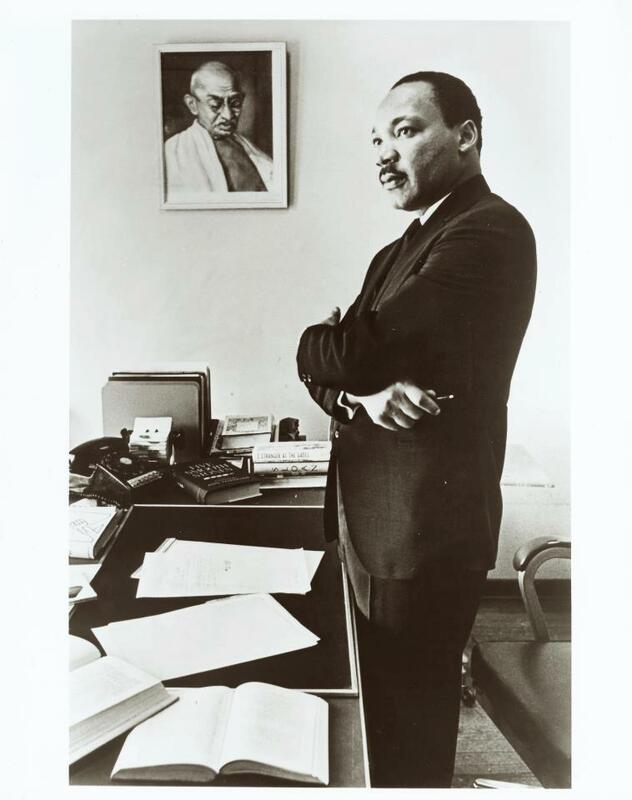 What I notice most of Martin Luther King Jr’s space is the portrait of Mahatma Gandhi whose non-violence he found so inspirational (also, note the workmanlike quality of the desk and chair). Then there are those artists whose spaces feel inspirational or meditative. Anais Nin’s space looks very zen-like. It some ways it reminds me of a rock garden. I think this would be a great place to work. Roald Dahl’s space, including his well-worn chair, seems to be full of things to inspire him to be creative. Finally, you have spaces that are a little simpler, almost spartan-like. Jane Austen’s space seems hardly big enough to write on at all. She just needs a quill, ink, and parchment. Demure is the word that comes to mind when I see it. E. B White has also narrowed his space down to the essentials; it is a table with a typewriter and ashtray. He seems to have a nice view of water, possibly a lake. I find it interesting that he doesn’t have a chair. He is using a wooden bench, something akin to a church pew without any kind of comfortable cushion. I lean toward these latter spaces most. If I were to pick a space most resembling my current space, I’d have to choose that of Adrian Tomine. I, too, have a tall, uncluttered desk where I can stand or seat as I please. 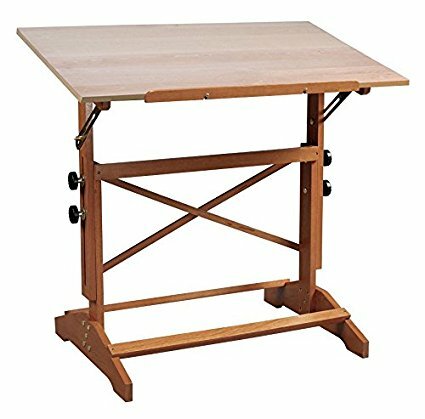 I like the drawing table I am currently using. Not only can I adjust the height, but the table angle as well (if interested, you can get it from Amazon here or click the picture below). If our space was a little larger, I would choose the bigger size, but the smaller top fits my space fine. The best writing hours for me come early in the morning, usually around 4 am. Quietly climbing out of bed, I stop only long enough to brew a cup of coffee before sitting at my desk and beginning to write. If I am working on poetry or editing, longhand is the way to go. For longer pieces of fiction, I use a thin laptop. I work best early because my brain is still in that dream-like state. The mind is still free to wander, and I am less critical and more likely allow the story to forge a path of its own. Also, you may have noticed the wall hanging I have in the photo of my space: that piece of copper in the worn green frame makes me very happy. I will tell more about that sheet of copper when I share the poem it inspired the day I found it. I’ve carried that sheet of copper more than two decades trying to find the right space for it; now, we are both home. I’d love to see you share your workspace comments and photo in the comments.